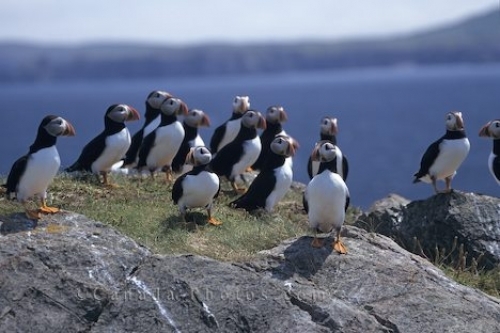 These cute little black and white birds known as Atlantic Puffins are the official bird of Newfoundland, Canada. These small Atlantic Puffins spend a majority of their time at sea and on occasion on the rock ledges that overlook the waters off Newfoundland, Canada. The times that they do come ashore is when they lay their eggs and incubate them. The Atlantic Puffins are also found on the coastline of Northeast US, Iceland, Greenland and the Brittany Coast of France. Picture of a group of Atlantic Puffins atop the rocks in Newfoundland, Canada.